Hey Eric, do you really like DD coffee or is it just a nostalgia for the east coast? Ultimately, where do you want your business to go? Do you want to be "the guy" until you decide it's time to hang it up or do you think that as you build on your success that you might want to add people? Did I read correctly (in the thread on spacers, I think) that you have a Seattle connection or spent some time up here? Is this true, and if so was this during bicycle-work or schooling or when? And do you ever come up for the Seattle Bike Expo? To my knowledge, I don't think anyone up here is doing custom stem and rack work like yours ( . . . pause: I know that as soon as I write that, I will soon hear about six people doing custom stem and rack work here in town, but oh well). Hey Matt- thanks! It's been cool to see you guys over the last few years as well. It's been neat to watch the local scene develop. Re: the OBCA- I really believe that the direction of the organization should be driven by the membership. While I see the board as helping keep the association on track and keeping the momentum I think the direction and goals should come from the membership. So, speaking just as a member I am excited to see the OBCA develop into more then just a show promotion organization. I think there is a mistaken impression that the one goal of the org is to put on the Oregon Handmade Bicycle Show. While the show is defiantly something we are excited about we are excited about it for two reasons maybe not entirely evident. The first is that it supports the mission of promoting handmade builders and the Oregon industry, and the second is that it is our major fundraiser for the year. Those funds help us do the other stuff, and it takes a couple of shows to get a pool big enough to feel the impact of. What folks might not realize (and what we need to do a better job of) is all the back work that is going on. In addition to the show promotion we are working on several items including promotion through other regional and national shows, professional development and tech seminars for the members, group purchasing and hopefully some group advertising. I would like to see us (all of us) start to make in roads with a wider customer base, specifically first time custom buyers and folks who haven't really considered (or even know about) what it is we do. In all sincerity I bounce the question back (and not just to you, but to all the members)- what do you want the OBCA to be, and what goals and outcomes are important to you? That isn't just hypothetical- call me and we can talk about it. I might as well take the opportunity to invite everyone to join, too. Local builders are of course welcome, but we have Industry and Enthusiast categories open to folks regardless of location that want to support Oregon frame builders. Feel free to contact me directly, or check out the site for more info. Regarding inspiration- that's a pretty wide one. Wade mentioned thinking about bikes all the time- the other day I was remarking to myself how much the profile or a urinal resembled a bike seat before spinning off into a form/ function/ design evolution thought train. I look at everything. I really enjoy contour and gesture in made objects, and I am particularly interested in the place where the visual clues to function overlap with the actual design (I wrote my thesis on that). As far as flickr and blogs- I like to look at my contacts photos and follow those out into their favorites. I have a pretty wide range of contacts, and some fortunate international blog coverage really opened me up to some of the Asian scene and to the Spanish speaking world (both in Europe and South/ Central America). That's been great in that it gives me some fresh visuals from around the world- both bike and non bike related. I look at a lot of family, landscape, architecture, travel, tattoo and car photos in addition to the bike stuff. In a similar vein I really enjoy seeing what different scenes are up to with regard to custom bikes. The stuff in South America has a different flavor then the stuff in Philly or Europe- it's great to watch how trends and styles move and influence each other (stay curves, lug cuts, etc). That kind of stuff really gets me going. DD coffee made in an actual DD east of the Mississippi isn't half bad, and when I was younger it was my gateway. Now my mom sends it to me on occasion as a nostalgia blast and I'll get through a couple of pots before my good sense kicks in. I think the stuff in the store is relabeled saw dust. Hmmm... At the moment I am really enjoying being a one man shop. At some point I'd like to hire a book keeper and an accountant, but I don't see myself having employees. I really enjoy the direct connection to the work, and I like the day in and day out of it. From a financial stand point it would also take a serious shift in how I run my business to have someone and cover their health care, workers comp, etc. This goes to Prentiss' question as well- I don't think a formal apprentice makes sense for me at the scale I see myself operating in over the next 5-10 years (and possibly much longer). I think the mentor route, answering questions, talking on the phone, via email and the occasional in shop visit makes more sense for me. I already do this, and it seems to work well with my hours, amount of free time, etc. In no small part it puts an impetus and certain commitment level on the person looking for info. I think folks were (and are) more willing to help me out if I show some effort and ask specific questions that show I've considered the situation. I think this goes to Matt's question about the OBCA, too. That said, I still get a kick out of the applications and resumes folks send me. I must be doing something right. I lived in Seattle for two years while my wife was in grad school. I worked for Montlake Bicycle (hi Neil!) and learned a lot about bikes, sales and customer service. I still have friends in Seattle and make it up several times a year. I was at the last SBE with the OBCA group (we were on the second floor). I'll be back for the Sound to Mountains Bikefest August 8th as well. Could you spend some additional time discussing your thought process related to leaving Bike Friday and going full-time? I would think that in the given economic climate that the relative stability (umbrella) provided by Bike Friday would act as a strong lure to staying; yet you opted for the tougher road. Also, do you see yourself branching out in terms of materials? Dabbling with carbon, Al, or even Ti? Are there materials you want to try out for personal edification and then move into your business? You know, "tested by Eric, so you know it's good" type of thing. The decision to leave BF was really a leap of faith in myself and what I was doing. I had a good reception, satisfied customers and a direction I wanted to go professionally and personally. I wanted to pursue the bike designs and style I was developing, and I wanted to have a start to finish connection with the bikes I was working on (at least as far as the metal work- Keith is a much better painter than I am, and I am happy with the relationship I've developed with him). When I handed in my two week notice it was a leap- I had wrapped up a customers bike and I had nothing on the table. It was a good gamble- by the time I actually opened my doors I had an order in and have had work since. I should say that I am still on great terms with the BF folks. They were very supportive with my side work, come to visit at shows and were always encouraging of the bikes themselves. I think steel is a fantastic material, and it really suites my style of design and build methodology. I can choose from a wide range of options to dial in the feel and durability without any real compromises, and building in steel is a conscious choice. I would like to dabble in other materials, at least ti and aluminum just to broaden my breath of experience, fabrication skill and reference. I'm less inclined to play with carbon for no other reason then shop space. I also really like the process of building in metal (blood and fire and all that). Would those end up as "Winter" materials? That depends on the arc of the business and customer base. If I can provide the same level of ride, fit and dependability for a given client in a package that is as clean as I would like it then I could see it happening. That said I'm in no hurry- I'm quite pleased with my current offerings and options. 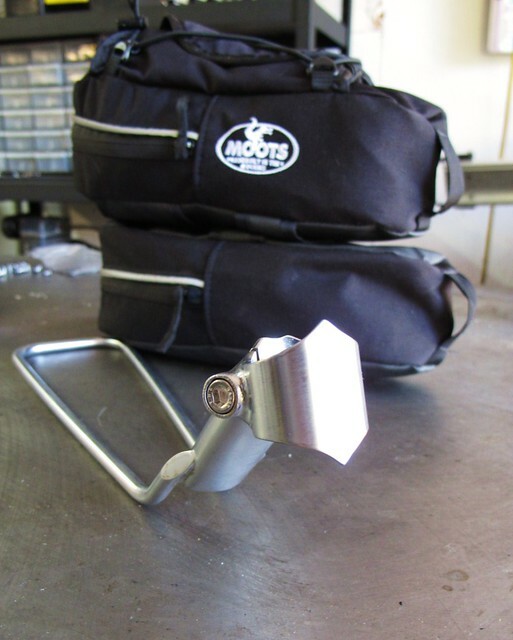 These are not (currently) a stock item- the benefit of doing these as custom units is that I can optimize the drop and set back for your bike, tire/ fender set up and seat tube angle. I try to run racks, stems and forks on a separate build schedule then the full bikes and try to do micro batches of these smaller projects to keep the turn around as reasonable as possible. If you are interested in something like this please shoot me a note or call. Thanks! Headed up to the Seattle area Sunday for the The Levee Breaking. Momentum picked up the buzz and posted a little blurb with a fun lead photo. I hope to see some of you folks out there this weekend! hmm, I used to live 2 miles from North Bend, good memories. Hope you had a good time. It was great! The weather (rainy morning) scared off a lot of riders, but the riders that showed seemed to have a great time. It's fun to show bikes at these types of events- lots of people that LOVE bikes, but are not necessarily "custom bike people" (YET!). Pretty low key, and non of the "builder as artist" stuff that can be intimidating to folks not used to bike shows. They just would walk up, pick up the bikes and treat them like, uh, you know- BIKES! Fun stuff. Couldn't beat the Mt. Si background! My little spread was right under the wedding arch- pretty spectacular views. Last edited by Eric Estlund; 08-13-2010 at 11:32 AM. We added a few new photo pages to the galleries on my site- so many of the bikes I do sit between categories it was sometimes hard to figure out where to list them. The titles below link you to some of the new stuff- take a few and poke around! 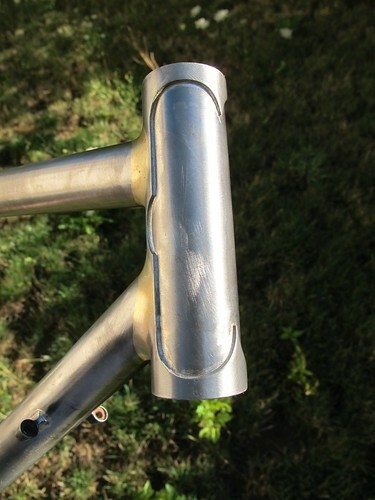 We've also added photos to the stem and rack selection. Last edited by Eric Estlund; 08-28-2010 at 11:56 PM. Info on that cross bike above posted in the classifides and also on my blog. I like to bring unpainted frames to shows- this one has gone to San Diego and a few local events, but it seems a shame to have it wait through cross season. Take it home and ride it! Yes, application specific. My best commuter pal insists on having tour-commuter, not simply a commuter-not simply a touring rig. I hope to help him with that. He's of slight build and 1" tubes are screaming at me. Look forward to seeing you in Austin. Last edited by WadePatton; 10-09-2010 at 08:25 PM. Hey Eric, let's revive this thing a bit. First, congrats on being where you are, doing what you're doing in the way that you are doing it. I mean that. Thanks, Wade! It is a fun road, and I think I've been lucky to have the experiences I have had. The first one I did was purely aesthetic, shaped more "lug like", and not really much of a looker. But it did light a fire! I do the bilam head and seat tubes for a number or reasons. First, I like burly tube to tube intersections, lack of an on-tube stress riser and all the academic benefits of strength and stress distribution of a fillet joint. 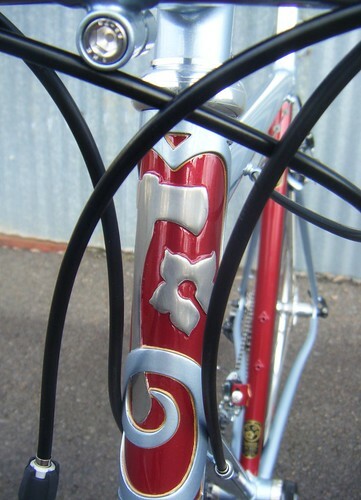 From a frame design standpoint they allow me a full range of freedom to design around the best tube set and tube placement for a rider- particularly useful for non standard tube combos (I do a fair number of all 28.6 bikes, like this example). Lastly, they provide a huge canvas for the aesthetic design and "lug carving" with more gestural room then traditional lugs. Just to be clear (because I get asked about this at shows)- I do build traditionally lugged bikes, fully fillet brazed bikes and combos in addition to my head tube type bilam and from-scratch lugs. I prefer to do the fit and functional design work on a bike first, then come back and figure out the best construction method for that bike followed at a distant third with the "look" considerations. I don't have a prefered construction method- just preferences based on the unique application for that rider. I love to do "out of category" bikes- most of my customers use bikes for mixed purposes, and I think there can be design purity in this. Rather then scoff at a "detuned" race bike or some such description I like to help clients find the best bike for their uses. That does require reigning in some folks of course, but there is a lot of room for high performance non-racing bikes in addition to the track, road, mtb and cross bikes. I had a great time at this years OHBS, and l look forward to meeting more of you (and you Wade) in Austin! Be careful what you say to reporters! Winter was recently featured (with other notables) in a Momentum articletaking a quick peek at the frame business here in Oregon. Thanks to Bryna and Momentum. Last edited by Eric Estlund; 10-13-2010 at 02:03 AM. Anthony Bareno of Velo Cult came out to the Oregon Handmade Bicycle show to shoot photos- while he was out he and his girlfriend Megan toured several frame builders studios. They were both enthusiastic enough to drive the 2 hours don to Eugene and spend a little time at Winter HQ. Here are the photos and a little write up.